Air brushed stenciling is one of the most versatile ways of using stencils. Airbrush stencils are used to paint complex art on cars to fingernails to body art with airbrush tattoo stencils. If you have been creating with airbrush stencils then you’re already aware of the many many ways they can be used. If not, prepare to be amazed. If you've used traditional paints with stencils you know how difficult it is to get a clean smooth finish of color. No problem with air brushed stenciling. Airbrushing stencils (as opposed to spray painting or hand painting with a brush) creates a very smooth, seamless and blended look. You can use an air brush stenciling technique for Mural Stenciling, you can make professional looking custom t-shirts, transform your car into a work of art on wheels, decorate fancy cakes or cupcakes (with food coloring of course), or even decorate your body with airbrush tattoo stencils. Be sure to check out our selection of graffiti art stencils that look great with either spray painting or air brushing stenciling methods. 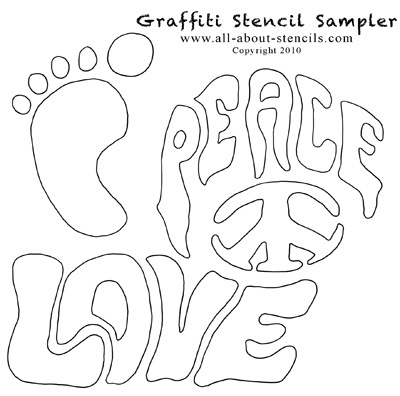 Here is just one of the free stencils you’ll find there. Below is a collection of great videos by expert Mike Royall from Expert Village. He is a lot of fun to watch and passes along some very useful information. In the first video, you’ll get some tips on the best materials to use for making your own stencils for airbrushing. Just a side note: I like to use my paper stencils but before cutting out the stencil pattern I cover the top with a clear protective coat like clear shelf liner. It makes the whole process much easier. They last longer and aren’t prone to tearing. This next video is all about cutting out your stencil. Like I always say, a stencil is good to get an image in place, then you can go back and add the detail. This is what you’ll see in this video. See how to create a more complex air brushed stenciling design by using more than one stencil. Would you like to build a web site like this one and turn a passion into a business? Well, if I did it, you can too! Don't think that you have to be a web designer and know all about computer codes. With Solo Build It! it's easy. They have the tools to help you create a successful web site. Want more information? Just click on Powered by Solo Build It! here or watch a video below. I know you'll get excited like I did. Watch the video below! Return to Home Page from Air Brushed Stenciling. Return to Airbrush Stencils from Air Brushed Stenciling.